Check with Wayne on your question. He has schematics on those cars and can tell you what to use. It would also depend on how many relays you are going to install and why you are doing this. Is this a race car or street? A relay is useful for controlling a high current source with a low current switch. you only have 3 choices for the power out..
A runs the accessories.. stereo.. and a bunch of other things that i will have to look at the diagram to describe. i3 usually runs the AC controls..
if you just want activation current.. not LOAD current. 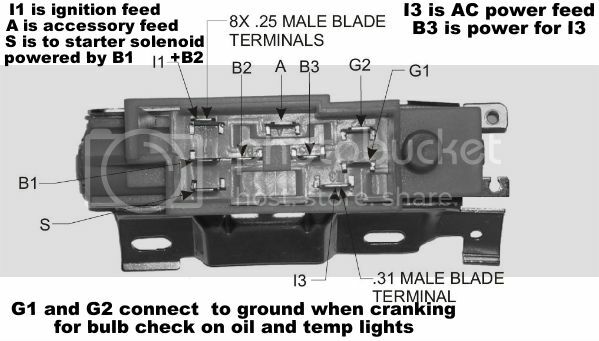 look at your fuse box.. there will be open sockets there that will be switched or unswitched.. these are on most GM fuse boxes.. some of these GM fuse boxes require special shaped wire connector bodies to connect in and latch in.. the junk yard is a great supply of these.. look under the dash of similar year full size gm cars .. think caddy.. olds buicks pontiacs.. they will have the most accessory connections plugged in.. many of those are also fused.. so the switched circuit might need a fuse installed ..
on the engine side of the firewall.. is a group of red colored wires up to a terminal stud . thats a good spot to grab current from for your relay.. depending on how many amps..
please.. with a test light.. hooked to ground.. probe the alternator output terminal.. it should light up the test light.. there is a big red wire plugged into the side of the alternator.. that one should also have voltage to light up the test light..
there are at least 2 fusable links at the top of the starter solenoid.. this is how you test to prove they are both good.. lets you know if you have blown out one or the other..
if you are going to power a massive car stereo system amp.. that needs to be hooked up differently but switched in the same way with the taps on the fuse box..
do you have a glass fuse box.. or the plastic plug in fuses?????? hi dave, waynes a bro, for sure for sure.